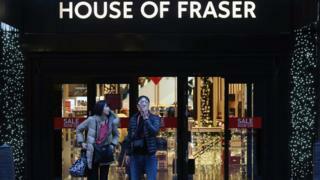 The House of Fraser department store chain has confirmed that it is seeking to reduce rents on some of its stores. The retailer confirmed that it had written to some landlords asking for their "support". The move, first reported by Sky News, suggests that it could be struggling after a tough Christmas for retailers. House of Fraser, which is due to reveal Christmas trading figures next week, announced closures in Leicester and Aylesbury, Buckinghamshire, last year. Rival chain Debenhams issued a profit warning this week after reporting disappointing Christmas trading. It said like-for-like sales in the UK fell 2.6% for the 17 weeks to 30 December amid a "volatile and competitive" market. A House of Fraser spokesperson said: "We can confirm that we have contacted some of our landlords asking for their support as we drive forward with our transformation programme." The Guardian reported that the chain wanted to reduce the size of its 59 stores by close to a third over the next decade by getting rid of top floors or basements. House of Fraser was bought by Chinese firm Sanpower for £480m in 2014. Last month the Moody's credit agency downgraded its credit rating for the retailer. It pointed to the company's weak results for the first three quarters of 2017, which it said were due to "both challenging market conditions and company-specific factors". The disruption from House of Fraser's new web platform and the underperformance of its in-house brands had weighed on the business, Moody's said. "A recovery in HoF's profitability is dependent upon either an improvement in the company's product offering or in cost-savings initiatives, which each involve execution risks," it added.